Just a single model this time. I’m very slowly painting up a small Warmachine force, and here’s the second one of my Khador Widowmakers. A wonderful model, although the straps, buckles and other assorted bric-a-brac are still a pain. I like how her hair turned out, as well as the browns. When I have the time and the energy (and I’ve finished the final two Widowmakers) it’s time to go to work on the Warjacks. Can hardly wait! This post will have the massive honour of being my last post this year. I’ve been painting a bit lately, and it’s time to show what I’ve been up to. 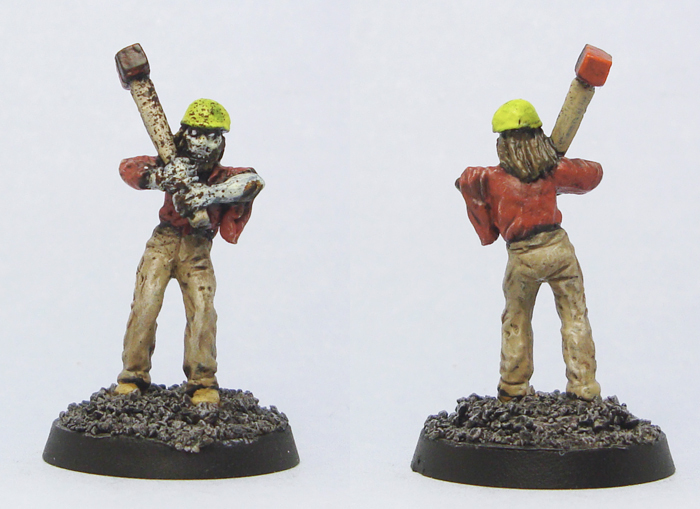 First up is a zombie from Mega Miniatures. Nothing fancy. The model had been on my desk for ages, so I spent an hour or so to get him off the desk and into the cabinet. A very simple paintjob, and I love going to town with the blood spray effect, which I think makes the sledgehammer even more brutal. 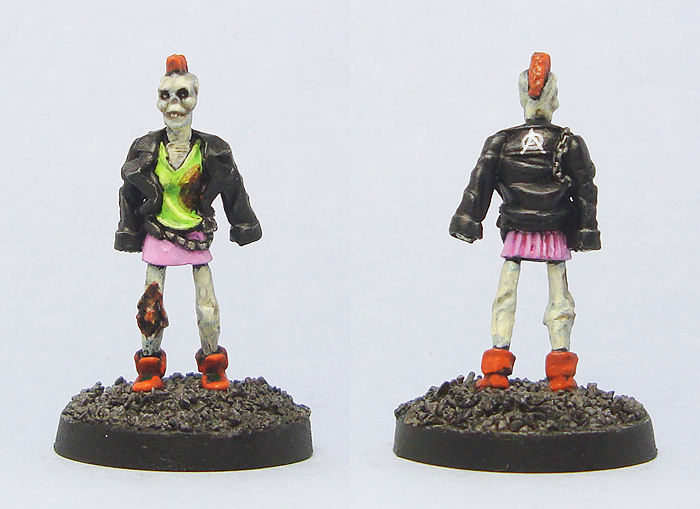 The next one is a zombie punk rocker from Recreational Conflict (go here for my review). I put some more work into her, and I think it shows. The presence of The Disciple inspired me to use some of my understandably less used paints, and I think they really made the punk rock look work. There’s a bit of a Warmachine fever sweeping our gaming group, and yes, it appears I’m getting into a new game system. What can you do, the models are just too lovely. I picked Khador as my faction of choice, as I really love their visual style. 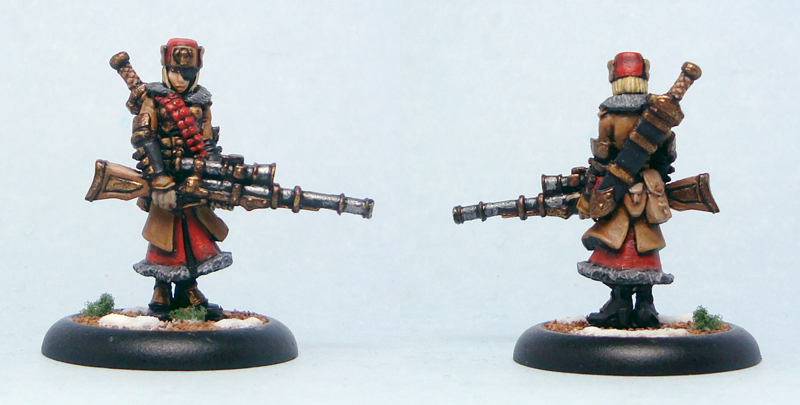 I’d also previously bought some Khador widowmakers to use as engineers/champions in my WHFB Empire army. They went into their originally intended service instead, and here’s the first of them painted. I think he came out pretty nice. I have to mention though, that bleedin’ steampunk basically means straps, straps, buckles, piping and straps. All of which are a pain to paint. Can’t have everything, I guess. With these I’d like to wish you all a happy new year! Keep painting, gaming, blogging and spending indecent amounts of money on miniatures and assorted largely useless paraphernalia. I know I will.